There's no way of getting around it: every year, the Oscars are guaranteed to be a monstrously long 4-hour affair (and that's not even counting the red carpet coverage). Most of us only care about the biggest awards, and yet have to wade through painful opening segments by the host, cheesy musical performances, endless montages and tributes, and awards for categories like sound mixing and "short form animated feature". And yet, many of us watch anyways, because the spectacle is like no other during awards season: it's bigger, fancier, more expensive, and more bombastic than any other, the height of Hollywood excess--and yet the idea of a 'humble' Oscars is simply out of the question. This year, however, there seemed to be a new common thread to the show and that was a marked, almost militant political bent where every celebrity seemed to be promoting a pet cause. The tone was set in the first two minutes of broadcast, as host Neil Patrick Harris--normally a safe bet for inoffensive humor and spectacular song-and-dance numbers--joked that the show would highlight Hollywood's "best and whitest...I mean brightest", a clear reference to the shutout of minorities from the best actor and actress categories this year. 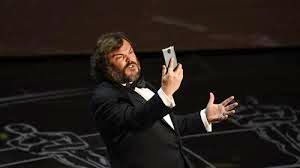 Even in the spectacular song-and-dance number that followed, Jack Black stole the show in a hilarious interruption that savaged Hollywood's reliance on formula superhero films and greedy corporate mentality. The show then settled from there into its usual mind-numbing routine, but little moments of social and political activism kept popping up--and sometimes in surprising ways. Patricia Arquette's acceptance speech after her win for best supporting actress ended with a passionate plea for women's rights and equal gender pay, which had luminaries like Meryl Streep on their feet cheering. Best actor winner Eddie Redmayne used his win to highlight sufferers of ALS, the motor-neuron affliction that Stephen Hawking (the man he portrayed in The Theory Of Everything) carries. 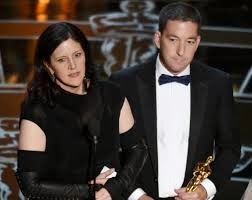 When Laura Poitras and Glenn Greenwald took the stage for their win in the best documentary category, their speech praised the controversial NSA whistleblower Edward Snowden, who was the subject of Poitras' stunning Citizenfour. One of the most touching speeches of the evening was given by best adapted screenplay winner Graham Moore, who recounted his own suicide attempt at age 16 as a means of highlighting awareness of the issue. 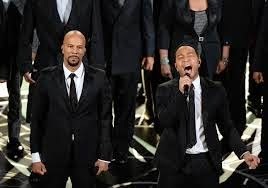 Even the best song category wasn't immune, as John Legend and Common's everything-including-the-kitchen-sink performance of "Glory" from the film Selma referenced civil rights flashpoints from Selma to Ferguson and earned them a standing ovation. In his acceptance speech, Legend noted that more black men are incarcerated in prison today than were enslaved in 1850 (this was fact-checked to be true, by the way). Finally, best director and film winner Alejandro Gonzalez Inarritu spoke about the immigration issue that his fellow Mexicans face in the United States. And if all of that socio-political grandstanding seemed too heavy for the average viewer merely tuning in for some light entertainment, we did get to see what was perhaps the first-ever thank you given to a winner's dog in one speech! As for the winners themselves, the best actor and actress categories were a virtual lock, as Eddie Redmayne and Julianne Moore had swept all other award shows this season. The best picture, director, and screenplay categories were unsettled, however, with Birdman and Boyhood generally seen as the two films battling it out this year. In the end, Boyhood (which had been a clear winner at the Golden Globes) was shut out in all but the supporting actress category, while Birdman took home a clean sweep of the screenplay, director, and picture awards. The film is also one of the rare comedies to win the Oscar for Best Picture, perhaps reminding us that even on a night as seemingly serious and packed with issues as this one, it was humor that reigned supreme. PS Let's not even talk about John Travolta's creepiness, OK....? At 4seating.com, we have the largest selection of in-stock and ready-to-ship home theater seating and home theater furniture available! We offer theater seating and design solutions for both the casual and professional home theater enthusiast. We also have a complete line of custom home theater decor available. 4seating.com is the place for home theater seating. We have the largest selection of in-stock and ready-to-ship home theater seating and home theater furniture available! We offer theater seating and design solutions for both the casual and professional home theater enthusiast. Call us toll free at 1-800-407-8665 with any questions. We also have a complete line of custom home theater decor available.